Make skinny Caramelized Onion Dip with Greek Yogurt instead of sour cream. Paired with the right dippers, you can enjoy this low-calorie, gluten-free dip with a smile because it’s HEALTHY! 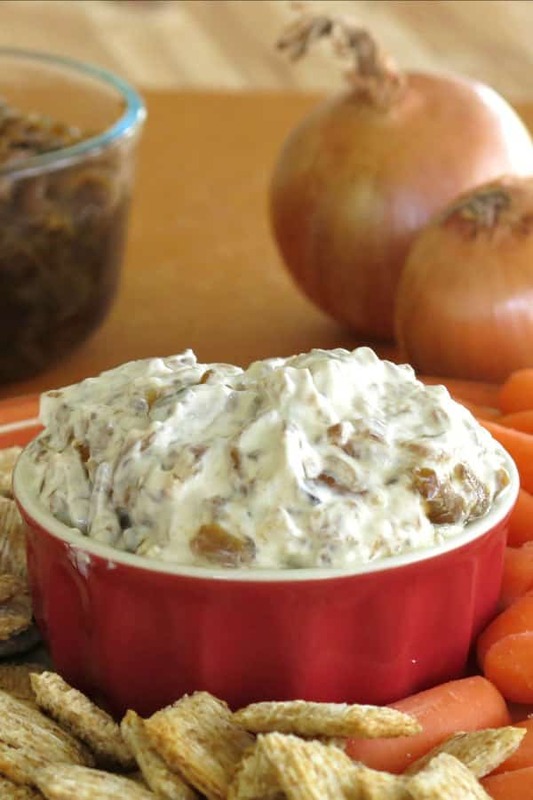 I’m giddy because I can sit down with a serving of this homemade French onion dip and some vegetables and enjoy it…guilt-free…because it has been lightened-up! Last week I was deep into Slow Cooker Caramelized Onions. I love caramelized onions and I made LOTS of them. (So, I have bags and bags of them stowed away in the freezer.) Apparently, I was unconsciously thinking of all the ways I could use them. At one point I was about to have a cup of yogurt for a snack when I decided that this recipe had to happen immediately. Doesn’t everyone eat yogurt with onions in it? Normally I steer clear of dips with lots of sour cream, mayo and such things…not because I want to, but because they are a trigger and I really can’t stop! Swap Greek yogurt for sour cream…you’ll get a protein boost too. Select dippers that won’t break the calorie bank like carrots, snap peas or any of these healthy alternatives to chips. As for the caramelized onions, just pull a package from the freezer and defrost. You did make a big batch in the crock pot…right? If not, to make them on the stove-top instead like we did for Butternut Squash Pizza with Caramelized Onions. And, yes I hear ya! 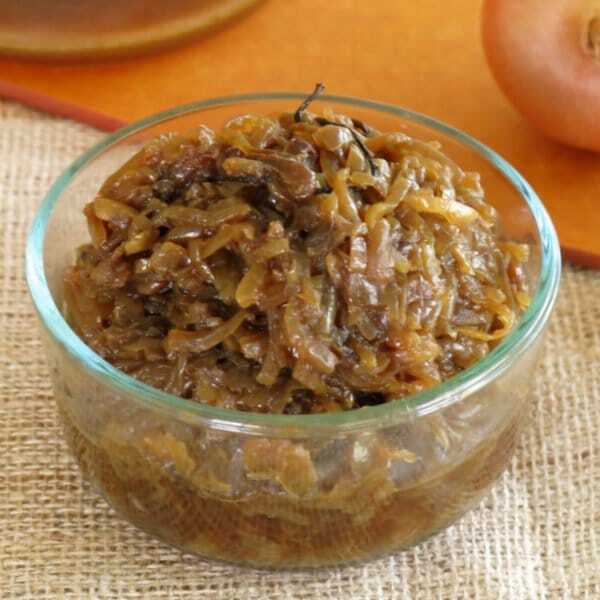 I’m a little obsessed with caramelized onions right now! Nope. Not done yet. 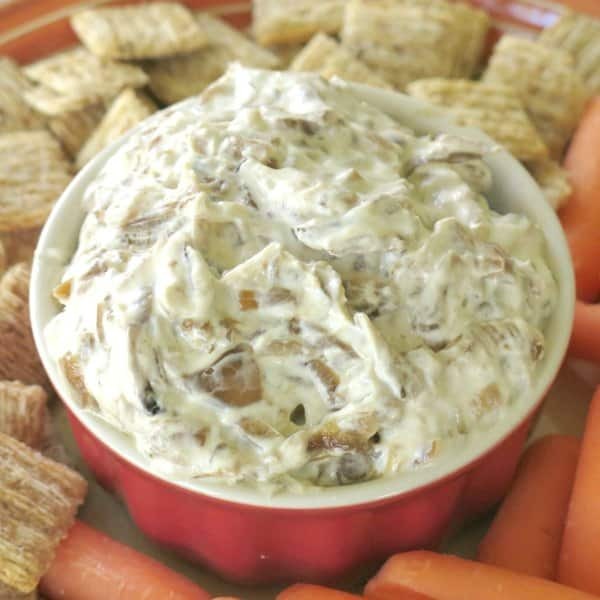 So for the love of dips, try out this lightened-up version of caramelized onion dip with Greek yogurt…and enjoy the party! 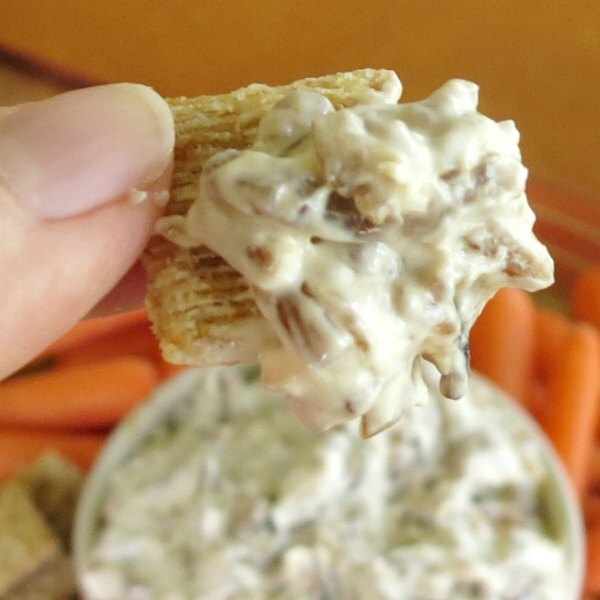 Caramelized Onion Dip is lightened-up with Greek yogurt. Choose the right dippers and you have a low-cal, gluten-free snack you can smile about. Add the first 4 ingredients to a mixing bowl. Using electric beaters, mix ingredients for about a minute to fully combine and fluff the dip. Melt butter in a large pan over medium-low heat. Add olive oil and onions to pan and stir to coat. To caramelize onions, cook onions over medium-low heat for about 30 minutes. Check and turn onions every 5-10 minutes until the onions are brown, but not burnt. NEVER MISS A RECIPE! SUBSCRIBE BY EMAIL! Love that photo of the big bowl of caramelized onions!! This dip must be amazing! So, it’s cool if I eat extra then, right? (Just agree…) Yum! I love onion dip. I especially love an onion dip with caramelized onions. I’m going to have to try your crockpot method of onions for next time I make an onion dip. This looks totally decadent – and I’m so thrilled that it is lightened up! Can’t wait to try it! Perfect game day food! Love it! I am going crazy for this dip! This is so my kind of dip! I love using Greek yogurt for sour cream. So, I made a “french onion dip” for a party once and my bro and his friend downed the entire batch– good thing it was just greek yogurt, zucchini, and some spices. lol! I’ve been dying to recreate that recipe so thanks for inspiring me.. it would make great tailgate food. Just when I thought I couldn’t love your slow cooker caramelized onions any more … you go and make DIP out of them! This is definitely going on my list of recipes to try. I’m a sucker for a good dip and this one sounds great! 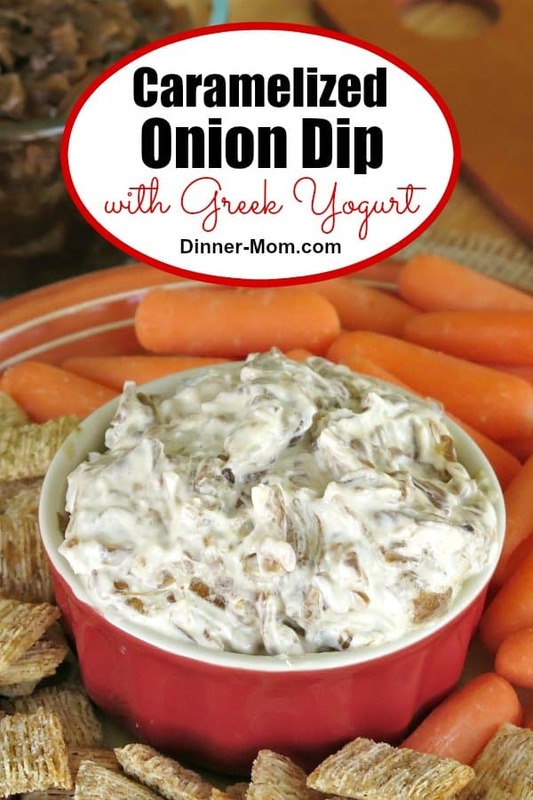 I love the caramelized onions and the lighter Greek yogurt dip. Um… Well… I haven’t made those caramelized onions yet, but now I’m FULLY convinced. I need this caramelized onion dip in my life. I love dipping and since this delicious dip is lightened up, I can (almost) dip to my heart’s content. I heart caramelized onions. I heart dip. I heart you for making caramelized onion dip. Caramelized onions are kind of like bacon… they make everything that much better! Looks fabulous! It was amazing! Took longer than 20 minutes to carmelize but this is soooooooo good! ThNk you! This dip is always the first thing to go at a party. It’s delicious! Anything with onions is a hit in our house! This was so easy to make and DELISH! Perfect for snacking or for parties and events!